After extensive refurbishment, a new look Arnolds Restaurant is now offering diners a stylish and contemporary dining experience overlooking Sheephaven Bay on Donegal's Wild Atlantic Way. 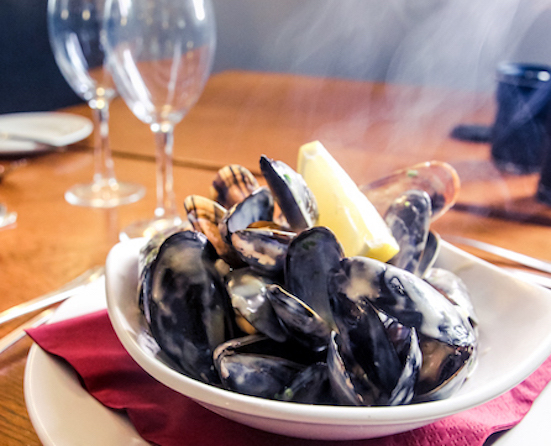 As proud members of the Donegal Food Coast our a la carte menu has been designed to feature the finest selection of local ingredients from land and sea including fresh seafood from Sheephaven Bay, local Horn Head lamb and seasonal garden vegetables from local farms and greenhouses. Keep an eye on our Specials Board for the finest local catch and seasonal produce our Chefs adore! At Arnolds we take great pride in producing our own homemade products for our guests. We bake our own Wheaten Bread and Guinness Bread as well as buttery shortbread and scones served with fresh cream and homemade jams - a real treat which all our customers enjoy. Our desserts are freshly prepared by our Pastry Chef often using seasonal home grown fruits from the hotel gardens such as Rhubarb, Gooseberries, Blackcurrants, Apples and Pears. We also use our own hotel garden produce in our homemade jams and preserves. Our A La Carte Menu is available from 6pm in our Restaurant and from 4pm in our Bar. We serve Lunch every Saturday from 12.30pm to 3pm and every Sunday from 12.30 to 3.00pm ,Table Reservations can be made for any number of guests by calling +353 74 9136208. Please contact us if you wish to book a special occasion in Arnolds Restaurant. We cater for Hen Parties, Weddings, Anniversary Parties, Birthday Parties, Christening Parties, Confirmation and Holy Communion lunches. We have a selection of menus for you to choose from and you are very welcome to call any time to have a look around and discuss your requirements.